for both allies and enemies. I am aware of the /sm toggle option. Is there a way to code it so that it starts minimized? /sm reset should do the trick. Last edited by micluvin : 05-12-12 at 10:01 PM. My wife and I are both running this, and we have a slight issue. Her Simple meter is reporting #'s around 300 higher than mine is, for everyone in the party/ raid. I am typically the main tank, and she is typically the main healer, not sure if that has anything to do with it, but we just can't figure out the disparity. Is it distance? The fact that I get a few seconds more in the fight than everyone else or what? This is a limitation of how SimpleMeter works- because SM registers her as starting combat later than you, everyone's numbers are higher. You should compare combat durations, too- I'd be willing to bet yours are longer, which would result in lower (but more accurate) numbers. Since you are the tank, combat begins when YOU first grab a mob; not when she first enters combat. Your SM log will be far more accurate for the entire raid. 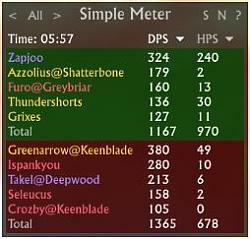 Lately, simple meter doesnt seem to be stopping session .. for example i was just in a dungeon and ended up with a 23 minute parse, instead of one for each fight. I wonder, does this addon count overhealing as heals? But really missing an option to start to fight when the mob is first engaged. So that it's able to show the entire encounter length instead of each players personal one. Not sure if this is doable or not though of course. A faster recognition of people dying would be on my wish list as well. Any chance you can update simplemeter to include damage from fire elemental pets? Elementalists are viable DPS now(not uber, but viable), but the fire elementals are a large percent of our damage so simplemeter is kinda useless in tracking our dps right now. I saw where you added support for necro pets, so wouldn't think it would take much more to add in fire elementals as well. Keep up the good work. I thought necro pets were fixed but I think the Rift API only allows lookup on the "main" pet. Since fire elemental pets aren't considered main pets, they'll always be counted separately. I'll try to get Trion to fix this, but until that happens there's not much I can do. Is it possible, when using the "All" setting instead of showing per session, to not lower the DPS of enemies/allies who were not active in some of the sessions? So it only counts the time that the entities were in a session. In other words, if there is a session for 1 minute where Jack deals 6000 damage total and Ted deals 6000 damage total, and then another session for 1 minute where Jack left and Ted deals 6000 damage total... when you change from showing session by session to showing everything combined, Jack's DPS would be 100, since he was only in the first 1 minute long session. Currently, Jack's DPS would be 50. If you want me to clarify more, I can. I understand that this feature may not be desirable by everyone, so I propose that, if you were ever able to implement something like what I stated above, there should be perhaps a third toggle. Session per session, All, and a new one, "Dynamic All" or whatever you want to call it. Thanks a lot! Great addon! Is the developer of this addon still working? No communication/update for weeks. 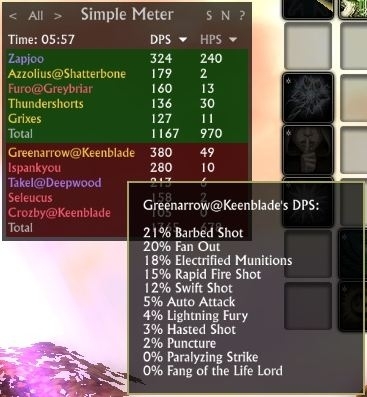 And I would really like some update for this addon, to avoid missleading datas when u die on an encounter, and the addon stops counting dps/hps. The split personality issue should be fixed now with version 2.3. It depended on features that weren't available until 1.6 was released. As for the issue where tracking stops on death, that will remain a limitation of this addon for the forseeable future. I like this addon, it's pretty good. But is there a feature in the works yet for a way to minimize it when you don't need it on the screen, or to only show up during combat, or both of them features together? Like maybe a + and - sign that changes when you click it, if it shows a + click it to maximize it which allows it to show up on the screen, and then if it shows a - lets you hide it so it doesn't show on the screen, but always keep that button available on the UI screen somewhere. That would be awesome, very great way to have it seamlessly fit a custom built UI (when it's done, which I'm working on). You can create a macro for /sm toggle which will allow you to show/hide SimpleMeter.